Windows Internet Explorer 9 (IE9) is a version of the Internet Explorer web browser from Microsoft. It was released to the public on March 14, 2011. Microsoft has released Internet Explorer 9 as a major out-of-band version that is not tied to the release schedule of any particular version of Windows, unlike previous versions. It is the first version since Internet Explorer 2 not to be bundled with a Windows operating system, although some OEMs have installed it with Windows 7 on their PCs, as well as new Windows 7 laptops. The system requirements for Internet Explorer 9 are Windows 7, Windows Server 2008 R2, Windows Vista Service Pack 2 or Windows Server 2008 SP2 with the Platform Update. Windows XP and earlier are not supported. Internet Explorer 9 is the last version of Internet Explorer to be supported on Windows Vista. Both IA-32 and x64 builds are available. Internet Explorer 9 Platform Preview 3 1.9.7874.6000 2010-06-23 83/100 HTML5 audio, video, and canvas tags, and WOFF. Internet Explorer 9 Platform Preview 5 1.9.7930.16406 2010-09-15 New icon. Internet Explorer 9 Beta 9.0.7930.16406 New user interface, download manager, and pinned sites with jumplist functionality. Internet Explorer 9 Platform Preview 6 1.9.8006.6000 2010-10-28 CSS3 2D transforms and HTML5 semantic tags. Internet Explorer 9 Platform Preview 8 1.9.8080.16413 2011-02-10 Performance, interoperability enhancements, and support for the W3C Geolocation API. Internet Explorer 9 Release Candidate 9.0.8080.16413 Improved performance, InPrivate Filtering renamed to Tracking Protection, a refined UI, support for more web standards, the option to add a new tab row, and other improvements. Internet Explorer 9 Final Release 9.0.8112.16421 2011-03-14 100/100 Improved performance, improved Tracking Protection, and the option to pin multiple targets per page. Microsoft first announced Internet Explorer 9 at PDC 2009 and spoke mainly about how it takes advantage of hardware acceleration in DirectX to improve the performance of web applications and improve the quality of web typography. These previews were not full builds of Internet Explorer 9, as they were for testing the latest version of the Trident layout engine. They were for web developers to send feedback on the improvements made, functioned in parallel with any other installed browsers, and were previews of the renderer technology only, containing minimalistic user interfaces and lacking traditional interface elements such as an address bar and navigation buttons. Microsoft updated these previews approximately every eight weeks. On November 23, 2010, two updates for the Internet Explorer 9 Public Beta were released. KB2448827 brings improvements to reliability and fixes stability issues from the previous beta release. There are not much details of resolved issues disclosed by Microsoft. Moreover, KB2452648 resolves the in-built feedback issue with Internet Explorer 9 and the latest version of Windows Live Sign-in Assistant. These updates can be fetched from Windows Update or the Microsoft Download Center website. On the same day, Internet Explorer build 9.0.8027.6000 based on Internet Explorer 9 Platform Preview 7 was leaked. On February 10, 2011, the Internet Explorer 9 Release Candidate and Platform Preview 8 were released. The Release Candidate version featured improved performance, a Tracking Protection feature, a refined UI, support for more web standards, and other improvements. The final version of Internet Explorer 9 was publicly released during the South by Southwest (SXSW) Interactive conference in Austin, Texas, on March 14, 2011. Enhanced Tabs and Tab Page: the new tab page can show most visited sites, and tabs are shown next to the address bar (there is an option to have a separate row, like in Internet Explorer 8) with the feature of closing an inactive tab. Tabs can be "torn off" which means they can be dragged up and down to be moved from one IE window to another. This also ties in with the Aero Snap feature. 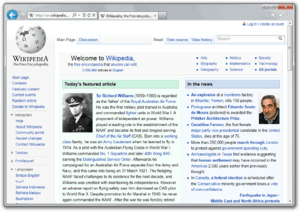 Compact user interface, which includes the removal of the separate search box found in Internet Explorer 7 and 8. Also removed is the tab menu list found in Internet Explorer 8. After its final release, 32-bit Internet Explorer 9 has been tested to be the leading mainstream browser in the Sunspider performance test. The engine significantly improves support for ECMA-262: ECMAScript Language Specification standard, including features new to the recently finalized Fifth Edition of ECMA-262 (often abbreviated ES5). The Internet Explorer 9 browser release scored only 3 faults from 10440 tests in the Test262 Ecmascript conformance test (Ver. 0.6.2 5-Apr-2011) created by Ecma International. The 64-bit version of Internet Explorer 9, which is not the default browser even on 64-bit systems, does not have the JIT compiler and performs up to 4 times slower. Internet Explorer 9 has improved Cascading Style Sheets (CSS) support. The Internet Explorer 9 implementation report, which was created using Internet Explorer 9 Beta, shows Internet Explorer 9 passing 97.7% of all tests on the W3C CSS 2.1 test suite. This is the highest pass rate amongst CSS 2.1 implementation reports submitted to W3C. Internet Explorer 9 includes support for the HTML5 video and audio tags. The audio tag will include native support for the MP3 and AAC codecs, while the video tag will natively support H.264/MPEG-4 AVC. Support for other video formats, such as WebM, will require third-party plugins. 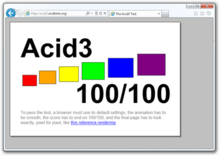 Internet Explorer 9 includes support for the HTML5 canvas element. Internet Explorer was the first browser to support web fonts through the @font-face rule, but only supported the Embedded OpenType (EOT) format, and lacked support for parts of the CSS3 fonts module. Internet Explorer 9 completed support for the CSS3 fonts module and added WOFF support. It is the first version of Internet Explorer to support TTF fonts, but will only use them if none of their embedding permission bits are set. Internet Explorer 9 implements the new W3C Navigation Timings format. Microsoft has been a part of creating this format during the development of Internet Explorer 9. Internet Explorer 9 supports two methods of tracking protection. The primary method is through the use of Tracking Protection Lists (TPL) which are now supplied by internet privacy-related organizations or companies. Tracking Protection by default remains on once enabled, unlike InPrivate Filtering which had to be enabled each time Internet Explorer 8 started. When a TPL is selected, Internet Explorer 9 blocks or allows third-party URI downloads based on rules in the TPL. Users can create their personal TPL's or select a TPL supplied by a third party. The other method is the use of a Do Not Track header and DOM property. Browser requests from Internet Explorer 9 include this header whenever a TPL is selected. Websites that follow this header should not deliver tracking mechanisms in their websites. At the moment following this header is a voluntary code of conduct but this method could in future be enforced by government legislation. These tracking protection methods were submitted to W3C for standardization. Internet Explorer 9 uses layered protection against malware. It uses technical measures to protect its memory like the DEP/NSX protection, Safe Exception handlers (SafeSEH) and ASLR protection used in Internet Explorer 8. In addition to those existing forms of memory protection, Internet Explorer 9 now opts-in to SEHOP (Structured Exception Handler Overwrite Protection) which works by validating the integrity of the exception handling chain before dispatching exceptions. This helps ensure that structured exception handling cannot be used as an exploit vector, even when running outdated browser add-ons that have not been recompiled to take advantage of SafeSEH. In addition, Internet Explorer 9 is compiled with the new C++ compiler provided with Visual Studio 2010. This compiler includes a feature known as Enhanced GS, also known as Stack Buffer Overrun Detection, which helps prevent stack buffer overruns by detecting stack corruption and avoiding execution if such corruption is encountered. Internet Explorer 8 used SmartScreen technology, which, according to Microsoft, was successful against phishing or other malicious sites and in blocking of socially engineered malware. In Internet Explorer 9, the protection against malware downloads is extended with SmartScreen Application Reputation. This warns downloaders if they are downloading an application without a safe reputation from a site that does not have a safe reputation. In late 2010, the results of browser malware testing undertaken by NSS labs were published. The study looked at the browser's capability to prevent users following socially engineered links of a malicious nature and downloading malicious software. It did not test the browser's ability to block malicious web pages or code. According to NSS, Internet Explorer 9 blocked 99% of malware downloads compared to 90% for Internet Explorer 8 that does not have SmartScreen Application Reputation feature. In early 2010, similar tests gave Internet Explorer 8 an 85% passing grade, the 5% improvement being attributed to "continued investments in improved data intelligence". By comparison, the same research showed that Chrome 6, Firefox 3.6 and Safari 5, which all rely on Google's Safe Browsing Service, scored 6%, 19% and 11%, respectively. Opera 10 scored 0%, failing to "detect any of the socially engineered malware samples". Manufacturers of other browsers criticized the test, focusing upon the lack of transparency of URLs tested and the lack of consideration of layered security additional to the browser, with Google commenting that "The report itself clearly states that it does not evaluate browser security related to vulnerabilities in plug-ins or the browsers themselves", and Opera commenting that the results appeared "odd that they received no results from our data providers" and that "social malware protection is not an indicator of overall browser security". Internet Explorer 9's dual-pronged approach to blocking access to malicious URLs—SmartScreen Filter to block bad URLs, and Application Reputation to detect untrustworthy executables—provides the best socially engineered malware blocking of any stable browser version. Internet Explorer 9 blocked 92 percent of malware with its URL-based filtering, and 100 percent with Application-based filtering enabled. Internet Explorer 8, in second place, blocked 90 percent of malware. Tied for third place were Safari 5, Chrome 10, and Firefox 4, each blocking just 13 percent. Bringing up the rear was Opera 11, blocking just 5 percent of malware. Due to technical improvements of the browser, the Internet Explorer developer team decided to change the user agent (UA) string. The Mozilla/4.0 token was changed to Mozilla/5.0 to match the user agent strings of other recent browsers and to indicate that Internet Explorer 9 is more interoperable than previous versions. The Trident/4.0 token was likewise changed to Trident/5.0. Because long, extended UA strings cause compatibility issues, Internet Explorer 9's default UA string does not include .NET identifiers or other "pre-platform" and "post-platform" tokens that were sent by previous versions of the browser. The extended string is still available to websites via the browser's .userAgent property, and is sent when a web page is displayed in compatibility mode. In Internet Explorer 9, the extensibility mechanisms for Browser Helper Objects (BHOs) and toolbars remain the same. Not loading BHOs or toolbars improves startup time, but limits the ability of developers to augment the user experience through these extensibility mechanisms. A release candidate was launched on February 10, 2011 in San Francisco. New features since the last beta version were tracking protection and use of hardware accelerated graphics, and improvements included faster performance and more support for emerging HTML5 standards. Noting that according to Net Applications, Internet Explorer's share fell to 56% in January 2011, the BBC quoted Microsoft's claims that Internet Explorer 9 is "playing catch up, but it leapfrogs everything" and "you are seeing innovation after innovation that other folks are catching up to." In The Register, Tim Anderson said Internet Explorer 9 was Microsoft's answer to the fall in Internet Explorer's market share (from 68.5% in July 2008 to 46% in January 2011, according to StatCounter). He felt it was "fast and polished", a "remarkable improvement" over version 8, noting "superb" development tools and "real and significant" support for HTML5, though "not as comprehensive as the company's publicity implies." However, configuration options are "strewn all over the user interface", and the "distinctive and excellent" ActiveX filtering and Tracking Protection features might be "perplexing for less technical users." Having reached release candidate status eleven months after it was originally announced at the March 2010 MIX conference, "Microsoft's development process is too slow." The new version is "a good modern browser" but "the competition is moving faster." On its first day of commercial availability, Internet Explorer 9 was downloaded over 2.35 million times. On 31 October 2011, PC World ranked Internet Explorer 9 as #19 on its 100 Best Products of 2011. The other web browser listed was Maxthon 3.1, a hybrid browser based on Google Chrome and Internet Explorer. A review of IE9 beta in PC World noted a performance improvement over IE8. At the February 2011 Mobile World Congress, Steve Ballmer announced a major update to Windows Phone due towards the end of 2011, which will include a mobile version of Internet Explorer 9 that supports the same web standards (e.g. HTML5) and hardware accelerated graphics as the PC version. Microsoft demonstrated hardware-accelerated performance of a fish-tank demo using a development build of mobile Internet Explorer 9 compared with slow performance on the November 2010 iOS 4.2.1 RTM of Safari on iPhone 4. ↑ The official advertising page of Internet Explorer 9 Archived March 5, 2012, at the Wayback Machine. ↑ "MS16-142: Security update for Internet Explorer: November 8, 2016". Microsoft. 8 November 2016. 1 2 3 Stephen Shankland (February 15, 2011). "Windows Phone 7 update to offer IE9". CNET News. Archived from the original on September 20, 2011. Retrieved 2011-03-24. ↑ Kannan, Vishwac Sena; Luu, Kevin (25 May 2011). "Internet Explorer 9 Now Available in 93 Languages". IEBlog: The Windows Internet Explorer Weblog. Microsoft Corporation. MSDN Blogs. Retrieved 26 May 2011. ↑ "Use RSS feeds in Internet Explorer". Internet Explorer Help. Microsoft. Retrieved 15 December 2012. ↑ "Windows Internet Explorer 9 for Microsoft Windows 7, Windows Vista, Windows Server 2008, and Windows Server 2008 R2", Microsoft, retrieved 2012-08-26, If you are licensed to use Microsoft Windows 7, Windows Vista, Windows Server 2008, or Windows Server 2008 R2 software (for which this supplement is applicable) (the "software"), you may use this supplement. 1 2 3 "A More Beautiful Web Launches on March 14th". The Windows Blog. ↑ Thurrott, Paul (18 November 2009). "Internet Explorer 9 Preview". Paul Thurrott's Supersite for Windows. Penton Media, Inc. Retrieved 26 February 2011. ↑ "Platform Update Supplement for Windows Vista and for Windows Server 2008". Support.microsoft.com. 2011-02-08. Retrieved 2011-05-10. ↑ Muchmore, Michael (2011-04-15). "Internet Explorer 10 drops Vista support". PC Magazine. Ziff Davis, Inc. Retrieved 2011-04-21. ↑ Keizer, Gregg (2011-04-13). "Windows Vista: No IE10 for you". Computerworld. Computerworld Inc. Retrieved 2011-04-21. ↑ "Download languages for Internet Explorer 9". microsoft.com. Microsoft Corporation. Retrieved 26 February 2011. ↑ Hall, Kevin (17 March 2010). "Internet Explorer 9 adds HTML5, drops Windows XP". Dvice.com. NBC Universal. ↑ Foley, Mary Jo (16 March 2010). "Microsoft IE9 developer preview with HTML5 support ready for download". ZDNet. CBS Interactive. Retrieved 26 February 2011. ↑ "Download Internet Explorer 10". microsoft.com. Microsoft Corporation. Retrieved 18 March 2013. ↑ Bright, Peter (April 15, 2011). "Microsoft's raw deal for Vista users: IE10 for Windows 7 only". ArsTechnica. Condé Nast. Retrieved June 11, 2015. 1 2 3 Hachamovitch, Dean (2010-10-28). "HTML5, Using the whole PC: Sixth IE9 Platform Preview Available for Developers". Microsoft. Retrieved 2010-10-28. ↑ "Benefits of GPU-powered HTML5". IEBlog. Microsoft corporation. 9 April 2010. Retrieved 26 February 2011. ↑ Galineau, Sylvain (23 April 2010). "Meet WOFF, The Standard Web Font Format". IEBlog. Microsoft Corporation. ↑ "Inside the final Internet Explorer 9 Platform Preview". arstechnica. ↑ Hachamovitch, Dean (2010-11-17). "HTML5, and Real World Site Performance: Seventh IE9 Platform Preview Available for Developers". Microsoft. Retrieved 2010-11-17. ↑ Brad, Sams (2011-02-10). "Internet Explorer 9 RC to launch on February 10". Neowin.net. Retrieved 2011-02-04. ↑ "Introducing Internet Explorer 9 Beta — Internet Explorer Blog at MSDN". Microsoft Developer Network. Microsoft. 15 September 2010. Retrieved 30 November 2010. ↑ Hachamovitch, Dean (2009-11-18). "An Early Look At IE9 for Developers". IEBlog on Microsoft Developer Network. Microsoft. Retrieved 2009-11-18. 1 2 Eric Law (May 29, 2009). "Q&A: 64-Bit Internet Explorer". MSDN Blogs > EricLaw's IEInternals. Microsoft. Archived from the original on 2011-02-21. ↑ "Updates for Internet Explorer 9 Beta - Internet Explorer Blog at MSDN". Microsoft Developer Network. Microsoft. 23 November 2010. Retrieved 23 November 2010. ↑ "Update for Windows Internet Explorer 9 Beta for Windows Vista and Windows Server 2008 (KB2448827)". Microsoft. 23 November 2010. Retrieved 23 November 2010. ↑ "Update for Internet Explorer 9 Beta feedback Tool for Windows Vista 64-bit Edition and Windows Server 2008 64-bit Edition (KB2452648)". Microsoft. 23 November 2010. Retrieved 23 November 2010. ↑ "Internet Explorer 9 Beta 2 Build 9.0.8027.6000 Leaked to the Web". Ditii.com. 2010-11-23. Retrieved 2011-05-10. ↑ "Internet Explorer 9 RC now available to download, tracking protection in tow (update)". Engadget. 10 February 2011. Retrieved 12 February 2011. ↑ Hilerio, I. (15 September 2010). "Pinned Sites: Windows 7 Desktop Integration with Internet Explorer 9". Microsoft Developer Network. Microsoft. Retrieved 26 February 2011. ↑ Pinning, Beauty of the Web. ↑ Sayre, Rob (2010-11-17). "Dead Code Elimination for Beginners". Archived from the original on November 19, 2010. Retrieved 2010-11-18. ↑ Preston Gralla (2011-03-16). "Internet Explorer 9 speeds past the competition". Computerworld. ↑ Steven J. Vaughan-Nichols (March 10, 2011). "Chrome 10 vs. Internet Explorer 9 Reconsidered". ZDNet. Retrieved 2011-03-21. 1 2 Adrian Kingsley-Hughes (March 15, 2011). "IE9 vs Chrome 10 vs Firefox 4 RC vs Opera 11.01 vs Safari 5 - The BIG browser benchmark!". ZDNet. Retrieved 2011-03-21. ↑ Adrian Bateman (2010-10-08). "CSS 2.1 Implementation Reports". ↑ "CSS 2.1 Test Suite Results". W3C. ↑ "Internet Explorer 9 Guide for Developers - CSS3 2D Transforms (CSS3)". Microsoft. 2011-03-14. ↑ "Internet Explorer 9 Guide for Developers - CSS3 Backgrounds & Borders Module (CSS3)". Microsoft. 2011-03-14. ↑ "Internet Explorer 9 Guide for Developers - CSS3 Color Module (CSS3)". Microsoft. 2011-03-14. ↑ "Internet Explorer 9 Guide for Developers - CSS3 Fonts Module". Microsoft. 2011-03-14. ↑ "Internet Explorer 9 Guide for Developers - CSS3 Media Queries Modulele (CSS3)". Microsoft. 2011-03-14. ↑ "Internet Explorer 9 Guide for Developers - CSS3 Namespaces Module". Microsoft. 2011-03-14. ↑ "Internet Explorer 9 Guide for Developers - CSS3 Values and Units Module (CSS3)". Microsoft. 2011-03-14. ↑ "Internet Explorer 9 Guide for Developers - CSS3 Selectors". Microsoft. 2011-03-14. ↑ "SVG in IE9 Roadmap". IEblog. 2010-03-18. ↑ "InPrivate Filtering: Microsoft Home Security Kit". Microsoft.com. Retrieved 2011-05-10. ↑ "Web Tracking Protection - List Format". W3C. 2011-02-24. 1 2 "Web Tracking Protection - Do Not Track". W3C. 2011-02-24. 1 2 Eric Lawrence (Microsoft) (2011-03-07). "Internet Explorer 9 Security Part 1: Enhanced Memory Protections". ↑ Marius Oiaga (2010-07-24). "IE8 Blocked Over 1 Billion Malware Download Attempts". Softpedia.com. ↑ Ryan Colvin(Microsoft) (2011-03-10). "Internet Explorer 9: Protection from Socially Engineered Attacks with SmartScreen URL Reputation". ↑ Rubenking, Neil (2010-12-15). "Google Responds to NSS Labs Browser Security Report". PC Mag. Retrieved 2011-01-16. ↑ Bakke, Kurt (2010-12-17). "Opera Also Questions IE Security Test Results". ConceivablyTech.com. Archived from the original on December 28, 2010. Retrieved 2011-01-16. ↑ Bright, Peter (2011-07-16). "Internet Explorer 9 utterly dominates malware-blocking stats". ArsTechnica. Retrieved 2011-07-16. ↑ "Web Browser Group Test Socially-Engineered Malware". NSS Labs. 2011-07-16. ↑ "Default User-Agent (UA) String Changed". Microsoft. April 13, 2011. Retrieved 2011-05-14. ↑ What happened to the Zone information on the status bar in IE9? ↑ Microsoft (March 19, 2011). "IE9 Final RTW Minor Changes List". Microsoft. Retrieved 2011-03-19. ↑ Brinkmann, Martin (March 16, 2011). "Can't Move Menubar In Internet Explorer 9". Retrieved 2012-12-07. ↑ Michael Muchmore (February 10, 2011). "Microsoft Launches IE9 Release Candidate". PC Magazine. Retrieved 2011-02-22. ↑ "Browser Market Share January 2011". Net Applications. Archived from the original on 2011-02-22. ↑ Maggie Shiels (February 10, 2011). "Microsoft's Internet Explorer 9 web browser goes live". BBC News. Retrieved 2011-02-22. ↑ Tim Anderson (February 14, 2011). "Microsoft's IE9: Don't believe the hype". The Register. Archived from the original on 2011-02-22. ↑ Dave Bailey (February 16, 2011). "Microsoft Internet Explorer 9 release candidate review". Computing. Retrieved 2011-02-22. ↑ Michael Muchmore (February 10, 2011). "Internet Explorer 9 (IE9) Release Candidate". PC Magazine. Retrieved 2011-02-22. ↑ "Browser Version Market Share". Net Applications. November 2016. Retrieved 2013-08-12. ↑ Ian Paul (March 16, 2011). "Internet Explorer 9 Downloaded Over 2 Million Times on Day One". PC World. Retrieved 2011-03-17. ↑ "100 Best Products of 2011". PC World. PCWorld Communications, Inc. 31 October 2011. Retrieved 5 November 2011. ↑ Cha, Bonnie (14 February 2011). "Multitasking, IE9 coming to Windows Phone". CNET. CBS Interactive. Retrieved 10 June 2013. Mediati, Nick (September 15, 2010). "Microsoft Internet Explorer 9 Browser Software Review". PC World. PCWorld Communications, Inc. Retrieved October 19, 2010. Gralla, Preston (September 15, 2010). "Internet Explorer 9 beta strips down for speed". Computerworld. Computerworld Inc. Retrieved October 19, 2010. McCracken, Harry (September 21, 2010). "Finally, a 21st Century Browser from Microsoft". TIME. Retrieved October 19, 2010. Stern, Joanna (September 15, 2010). "Internet Explorer 9 Beta review". Engadget. AOL Inc. Retrieved October 19, 2010. Crowley, Matthew (2010). Pro Internet Explorer 8 & 9 development. New York: Apress. ISBN 978-1-4302-2853-0.